The Miami Dolphins and Hard Rock International announced an 18-year agreement to name the newly renovated facility Hard Rock Stadium with help of International Music Superstar Armando Christian Pérez better known as “Mr World Wide” Pitbull. The venue will serve as the home of the Miami Dolphins, University of Miami football team, Orange Bowl, Super Bowl LIV and the 100th anniversary of the NFL and international soccer. 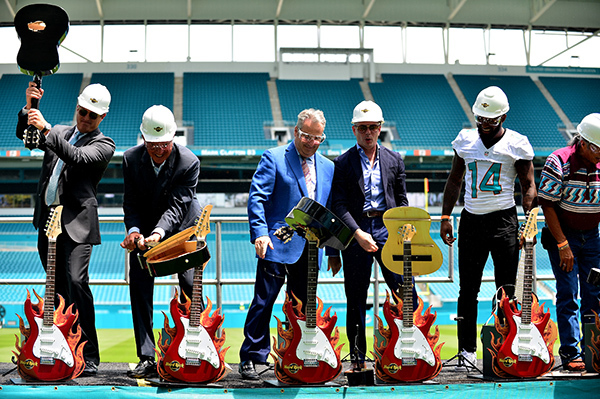 According to Miami Dolphins President & CEO Tom Garfinkel said about the Hard Rock brand. “They are synonymous with music and entertainment and have a rich history of philanthropy and community engagement. In addition to hosting major events, Super Bowl LIV, College Football Playoff Semifinals and major concerts, it was announced by legendary soccer player Pelé that Hard Rock Stadium has secured rights to host the Brazil Men’s National Soccer Team for a series of matches starting in 2017. In addition, Real Madrid will be returning to Miami in 2017 to launch play in the International Champions Cup. A new generation of musician "Kid Cudi-passion, Pain & Demon Slayin' Tour"
Wyclef Jean echoes the need for State of Emergency for Haiti after Earthquake.